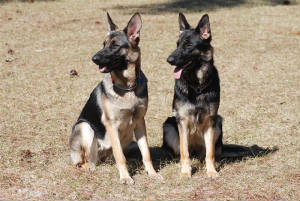 Happy 1st birthday to Roxie and Maverick's litter! Here's our little superstar Naya hasn't she grown into a gorgeous girl?! Thank you! Good hips good X-rays good health. 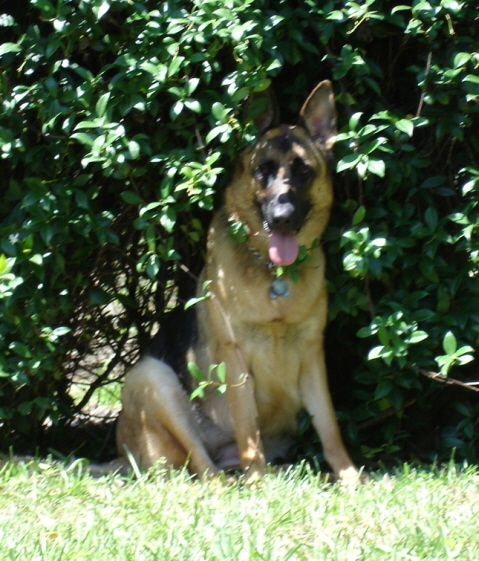 Loyal loving great watchdog for our busy neighborhood and super playmate for the kids always ready for anything! Great office dog and companion for me in the afternoon. All around great addition to our family thank you we couldn't imagine our lives without her! We'll be back one day for another! 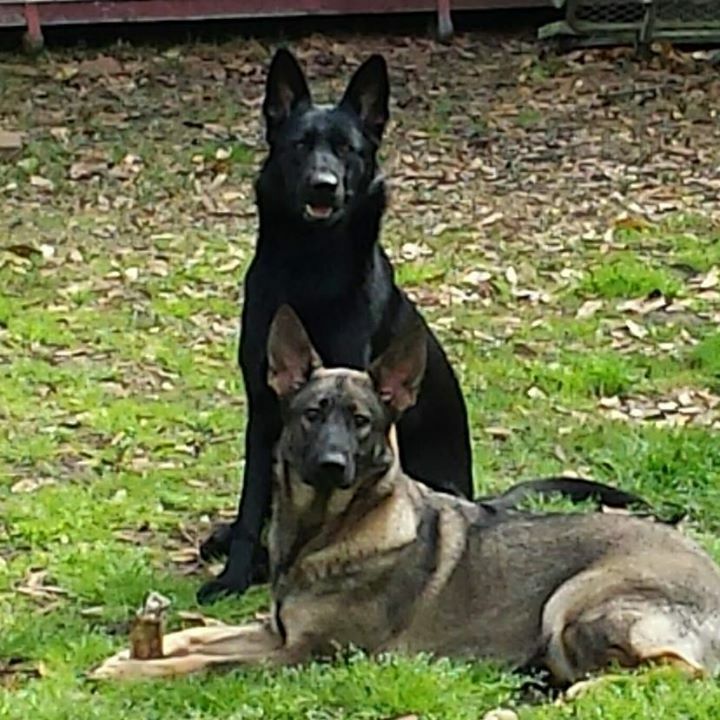 Cassie (right) is 5 1/2 months old and continues to be a sweetheart. We absolutely love her and especially her fantastic disposition with children and adults alike. He loves to play ball, and get chased around the house. He also loves watching birds outside, and planes as they fly over. He's still a good cooking buddy, and will hang out with me in the kitchen. He knows lots of tricks, and is getting better with obedience around strangers...he still gets excited and jumps a lot. The only people he won't let pet him are the ones who work at the vet because they keep sticking a thermometer up him at every visit. Barron is having a blast discovering the advantages of his new height as he grows. He can now jump on the table and one morning he ate my breakfast! He has also discovered the couch :) He is super smart and tricky. We love Barron so much, and are so thankful for him every day! Hope you and Emma are doing well! 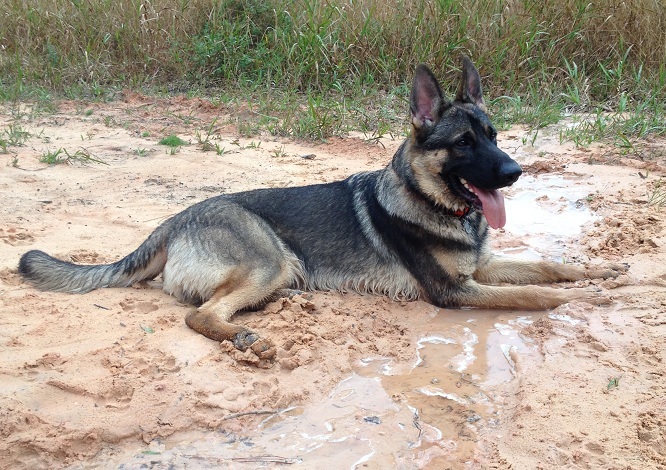 We wanted to share some pics of our baby boy Loki Vom Highdrive who turned 1 yr old yesterday! To celebrate, he had doggie ice cream and his favorite, a ham hock! This past summer he also went on vacation with us to the Keys and he stayed in the cabin with us overlooking the ocean. It had a Huge fenced yard there as well, so he & Pistachio could run and come & go as they pleased! We just LOVE LOVE LOVE our baby boy!! Thank you so much & hope this finds you both well!! I hope this finds you well. I just wanted to share a picture of Sookie with you. 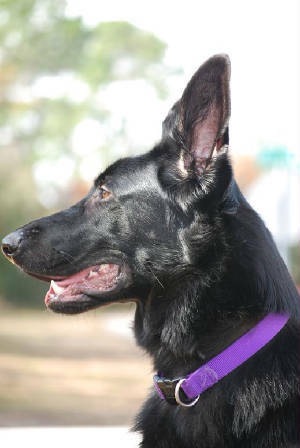 You can see from the picture that Sookie's white spot is still very visible, which we love because it sets her apart from other German Shepherd's. That tongue of her's is always out. It is so cute. At 1-year old, Sookie is now 72lbs. She is about the size you told us she would be. We travel back and forth from Florida to South Carolina every few weeks. Sookie is perfect in the car and loves to take rides. 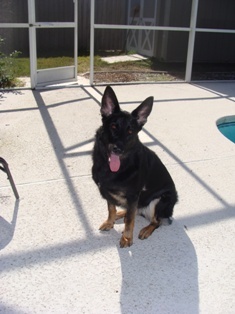 When she was 7 months old we sent her to obdience training and she did great. Sookie loves being with us and is very loyal. 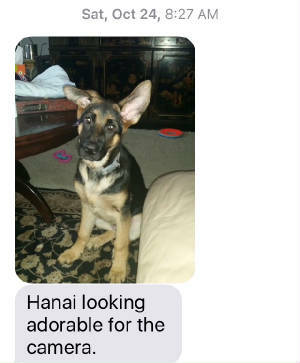 She is very smart and picks up commands quickly. We get compliments on how beautiful she and we always tell people where we got her. 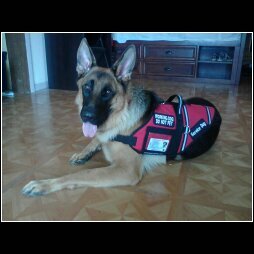 Linda, Morganna has gone thru everything but service dog training. Waiting until she is more calm. She is still puppy excitable when we go out. Would not trade her for anything, she is priceless. Everyone that meets her falls in love with her. 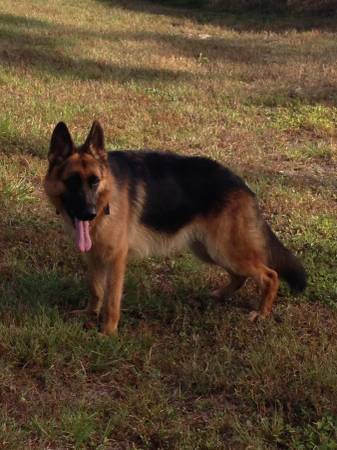 she is 26 inches at the shoulder and weighs close to 80 lbs1 year old. She is changing color. She now has tan stripes on the back of her legs. Paula . what do her parents weigh? Linda, Attached are some photos of Soldat. 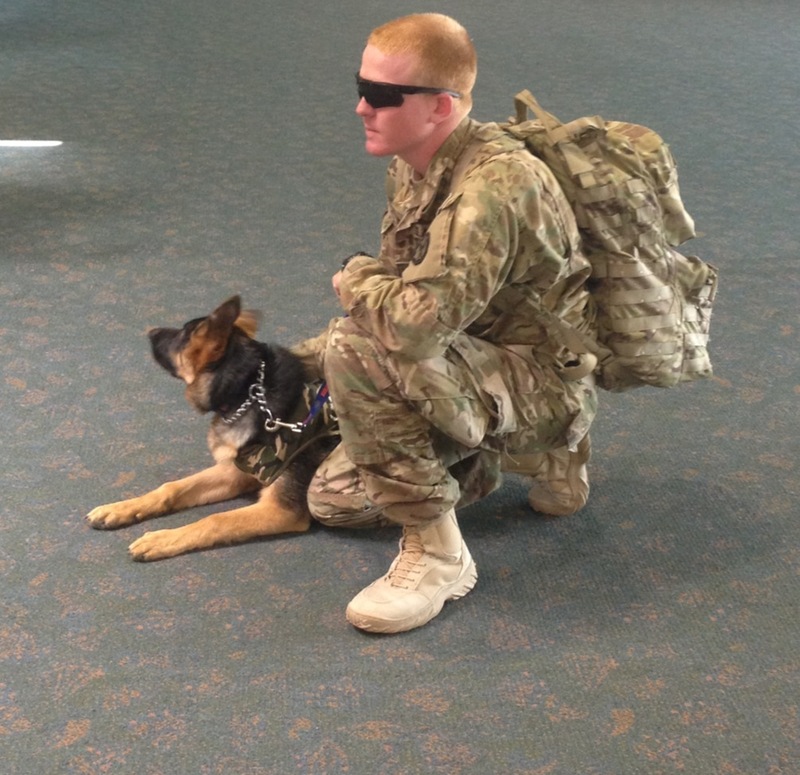 He is currently certified as a Service Dog, but as a Trainer for Police and Military Dogs I have done some detection work with him and tested his drives in all aspects. 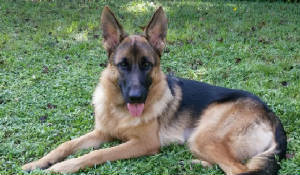 He has good balance and stability in his drives, while with minimal stim he rises to the occasion with civil agitation (with full fight drive) or will hunt with the best of detection dogs. The detection work to follow in another e-mail is a mail searching exercise. Please feel free to contact me for any other information I have. Here are few recent photos. She loves balls, bubbles and the swimming pool. We had to fence her away from the pool. It was not good for her skin and I think it makes her shed more. 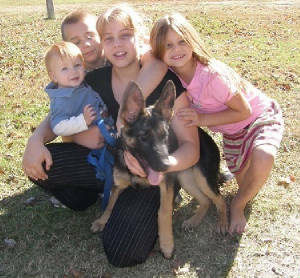 She is great with our young granchildren and is definitely the Best dog we have ever had. She is doing great, and is sweet, silly girl. She is approaching 70 pounds at 11 months old. 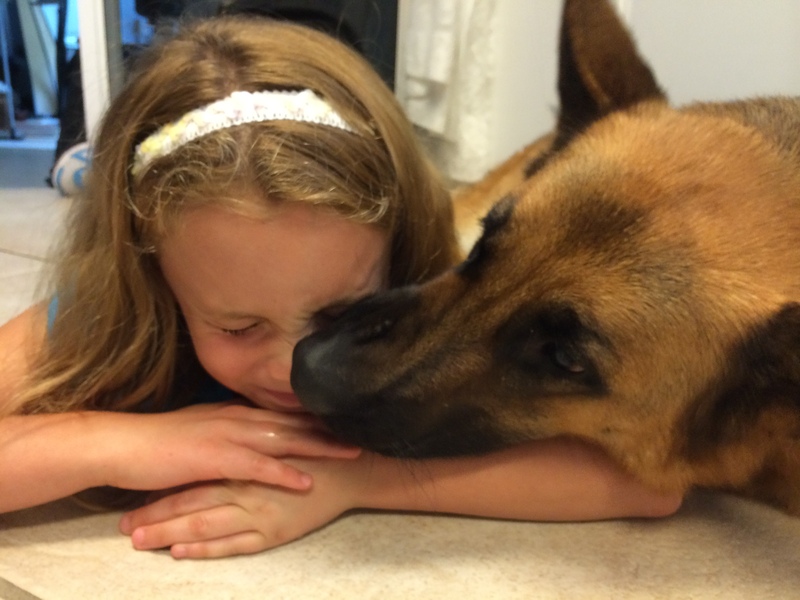 She absolutely loves ALL kids and other animals. 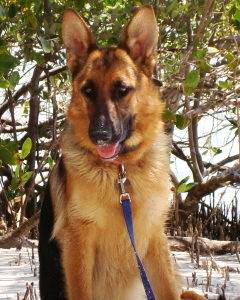 She is my companion on my daily walks and has always walked very well on a leash. It's clear she considers our 4 year old daughter, Maggie, her responsibility. Maggie always must be in Thora's view. Hard to believe we have had our puppy for a year already.... She is Wonderful. We love her very much. Spoiled rotten.She is making her 2nd trip with us to South Carolina this week. She is So smart! One of my customers wants to know if you have any puppies or will have any sometime soon. i just wanted to send you a recent pic of bia and jack. jack has been a wonderful edition to our family. he is a big boy at 7 mos he weighs in at 75 lbs. he is very smart and has very nice manners. bia is working toward her good citizenship cert. so she can become a therapy dog so she can visit nursing homes and hospitals. she has become such a social butterfly. and jack is learning his obediance and is coming along very nice. we get all kinds of compliments on our furbabies. I have refered people who want one like ours to your website. even our vet is trying to talk his wife into one of them since they are such a high quaility and healthy dogs. thanks again for such wonderful sweet and protective furbabies. 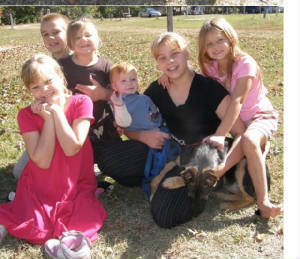 liz, steve, micheala, " bia and jack "
Hope this note finds you both doing well and enjoying the Christmas season! 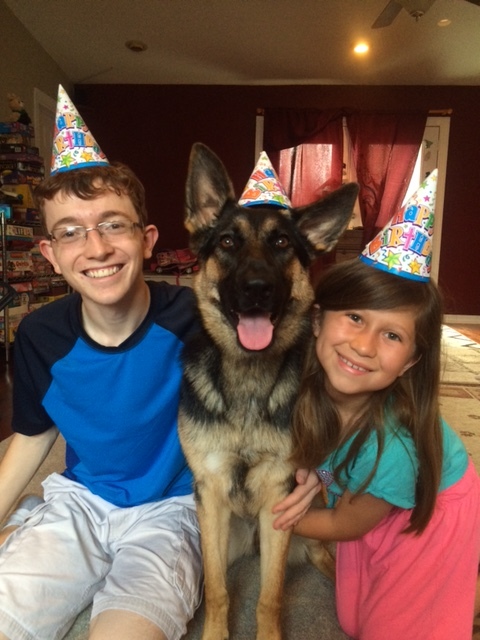 Well, Bella is now 1 year old. Hard to believe - she has grown so much. She is such a bright spot in our lives. 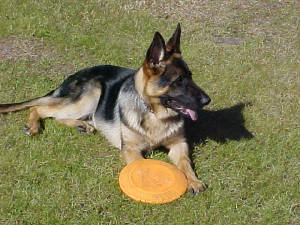 She loves to play frisbee, anytype of ball, and is doing very well in our "search" game. We hide a toy then ask her to search. Boy, the nose goes to the ground and air until she finds it. She also gives the local squirrels a run for their money. She walks through the yard like she is a member of Seal Team Six - then she runs after them while they jump into the trees and take off. 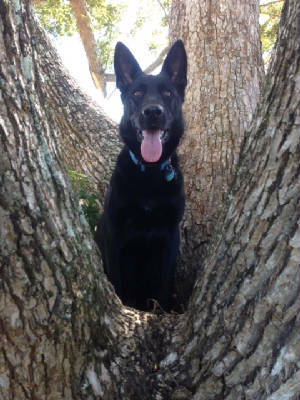 She will lay at the bottom of the tree and wait, thinking that is their only way back down. Sending a couple of pictures to show you how pretty she is. She is 98% black and 2% tan. Just Beautiful! We took her to the vet for her "manicure" and she weighed in at 81 pounds. Guess we will need to take her on longer walks. Midnight is doing SO wonderfully! What a super, super dog. 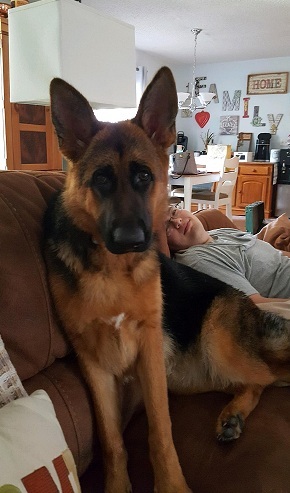 He is 8 months old now and around 70 pounds. 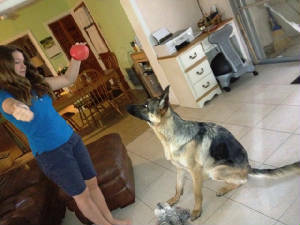 We have had individual training at home and also in a class being held at our local veterinarian's office. He gets compliments all the time on his excellent behavior. Everybody remarks on how "calm" he is, and how he is not a barker. When I walk him, sometimes other neighborhood dogs are running around loose and they come up to him. He is NEVER aggressive. He is always looking to be friendly and meet new dogs. 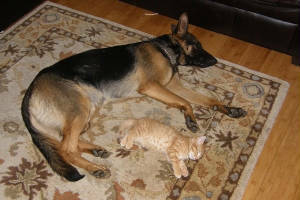 Even if he is provoked, he does not attack other dogs. He always looks to me for a command, and he is very focused, with excellent eye contact. He is a pleasure to walk and play with. We go down to a nearby field in my subdivision and throw balls. He's very good at fetching! I don't let him get too tired, though, because it's so hot out and he is black. The one funny thing about him is that he's a very sloppy drinker! I sometimes wonder if any of the water makes it into his mouth!!! Recently, we were over at my sister-in-law's house, and there were other dogs around. A little 2 year old girl wandered into the room where I was staying with the dogs, and she began to pull the other dogs' ears and tails. I didn't know what her name was, and she didn't speak English, so I couldn't get her to stop. I yelled for someone to get her parents so they could get her to stop hurting the dogs. Do you know that she grabbed Midnight's forehead and squished it, before I could stop her, and he did NOTHING! He was so patient and good. The other dogs yelped and snapped at her, but he was so generous with the child. It's good to know he has this wonderful, balanced temperament. We can take him for walks along Park Avenue in Winter Park, where it is very dog friendly, and he stays with us at the restaurant while we eat on the patio and enjoys a milk bone or chew toy. He's a great dining companion. Most people don't even know he's around, unless they want to say how beautiful he is. 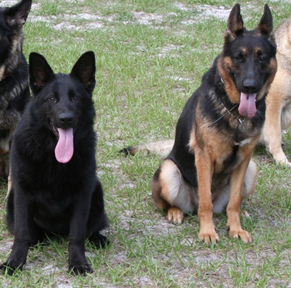 German Shepherds get a lot of attention. I just wanted to update you on our wonderful puppy. 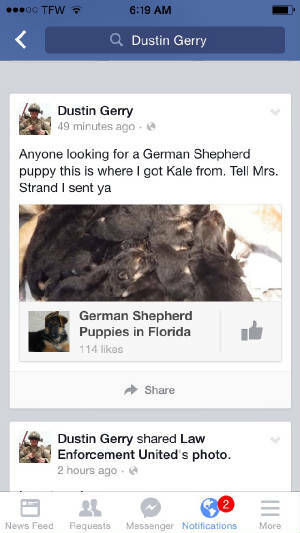 My mom routinely checks your web site for new puppies in case you have any females who are more tan than black. She likes the Rin-Tin-Tin style. I'm very happy with my dark doggie. He's SO beautiful. I will attach some pictures. Hope you and Emma are well! I just wanted to drop you a note to tell you how happy we are with Jager. He's 8 months old now and 75 pounds. He is without a doubt the sweetest, most well behaved dog I've ever had. He gets compliments everywhere I take him. One woman stopped in the middle of traffic to ask me if he was old enough to breed yet! I walk him to school every day to pick up Elizabeth and he is a local "Superstar" there. The kids line up to pet him, and he loves the attention. I am proud to say he's my dog. 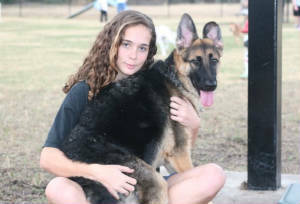 my name is liz rollo and we bought a opus puppy\selly puppy from you in september of 2009 she was born on 7/8/2009. she is a wonderful dog. we are looking for another puppy in the near future and i was wondering if there are any opus puppies available? if not do you have any pupppies available in a month or so we would perfer a blk and tan male puppy but are really not picky on color. 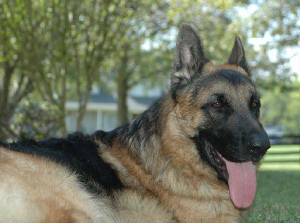 i have attached a couple of pics of our girl bia ( her reg name is ophilia von rollo but we call her bia). she is a wonderful dog. and when we started discussing a new one you were the first person i thought of for a new pal for bia. please let me know if you have any opus puppies planned or let me know what you might be having available soon. jack is doing great. he has finally stopped crying in his kennel and we can now sleep. but he is a fiesty little guy. bia loves him and is being a little momma. took him to the vet on tuesday and our vet dr waldy said you take excellent care of the puppies. he did sleep thru the exam but he was pronounced wonderful and got an a on his report card. thank you again for providing us with a wonderful healthy addition to our family. 7-18-11 Hello Linda and Emma! Bella is growing like a weed and I thought you might like to see how she looks at 7 months. She weighs 59.4 lbs today. She has really bonded with my husband, David. She follows him everywhere. I think she will be his running companion when she gets older. 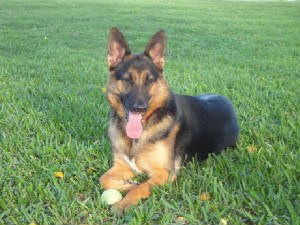 She has been through training with private lessons at home and socialization at Pet Smart. Our vet is very impressed with her good nature. At our last puppy check up, Bella actually jumped into her lap. Her bark when she is playing has a high pitch. 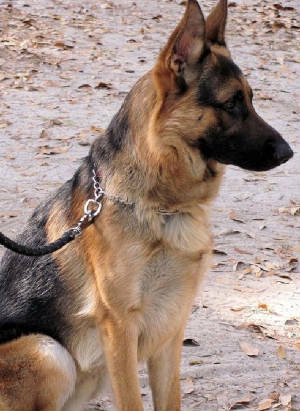 But when she sees something that should not be there it changes to a very low bark with her hair on her back standing up. Thanks for such a wonderful puppy. She really fits into our family very well. Enjoy the pictures. I'll send more as she gets bigger. Can you recommend someone that does aggressive training? 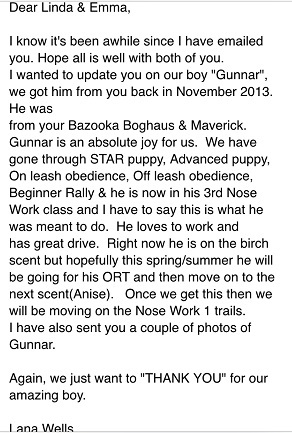 Baron von Bannister completed puppy, basic and now intermediate training so we’re thinking about the next phase. 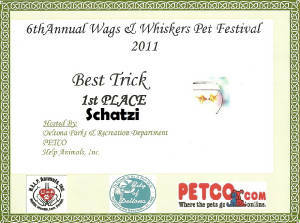 She is such a beautiful and amazingly intelligent dog- this prize was for playing soccer. As she grows we will send pictures to you and Emma. We had a great night last night. We moved the crate into our room on Saturday. Midnight slept from about 12 to 8 a.m. with only a little whimpering, and we did not wake up after about 1 a.m. So he did great! He never messes in his crate, and although we've had some accidents in the house, he is pretty good about keeping the pee-pee outside. He does a great job of pooping, too! After every meal! He's eaten well from the start. 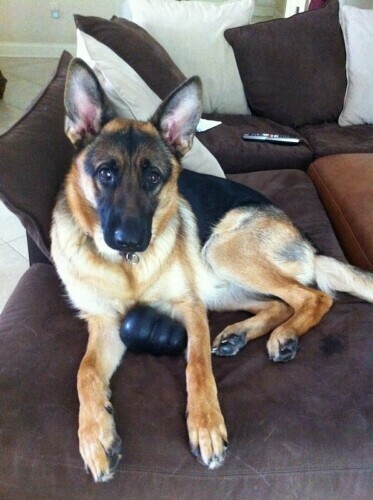 He loves the Kong toy filled with either peanut butter or treats. He sure gets aggravated when he can't get the treats out and barks at it! Eventually he does "win." He also likes the rope pull toy, and those rawhides. They keep him occupied for a long period of time. So far he has learned "sit," "come," and "down." He's very smart! Every day, we do a little bit of playing, and then we do a little bit of training, and then he follows us around and naps in various places when we are home. When we go out, he is put in the crate, and although he's not terribly happy about it, he manages. We've left some articles of clothing in there from me and Tom so he seems to enjoy that and sleeps on them. The kids are getting adjusted to him; , I'm teaching the kids to stop running away, and instead stand still and cross their arms over their chest. This way, Midnight will sit at their feet and wait for a "command" or some other action He's a very good puppy and very intelligent. Thank you for all your help. I'll send some more pictures soon. Just wanted to send you a picture of Suki all grown up. We drove upfrom Miami and purchased her from you about 18 months ago. 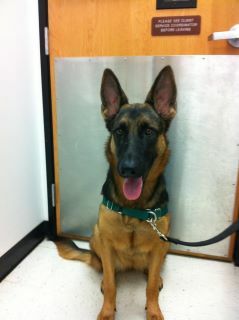 The Vet has told us that she is an excellent breed and she has made a great addition to our family. As you know I purchased Shady Lady from you, 2 years ago, and it was an immediate match. 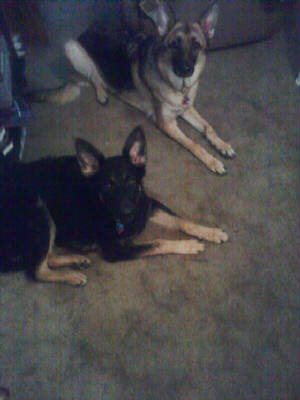 I had just lost a GSD that had been with me for 11 years, and Shady Lady and I took to one another immediately. 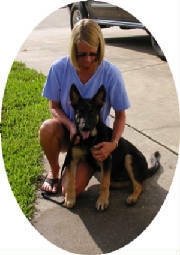 Shady was 5 months old at the time and full of personality and eager to learn and to be taught. I couldn't have found a better companion and friend than I have found in this dog. Thank YOU! She is always eager to go for a walk, play or just sit and have her head scratched. Although it sounds like she is just a household pet, she is far from it. 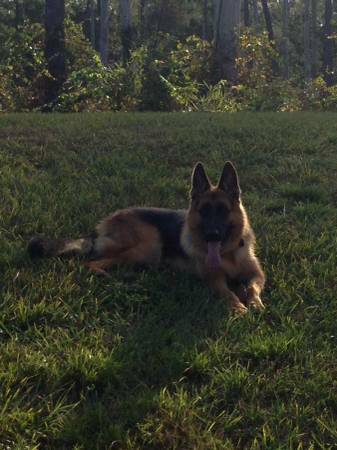 Shady will be completing phase two of Search and Rescue Training later this year. She is easy to work with as she keeps to the task at hand with very little correction. A fantastic work dog, as well as a pet, and I owe all of this to you. Well, fortunately the story doesn't stop there. I had already made up my mind to breed Shady Lady from the very beginning,due to her temperament and her desire to work. When the time came, I contacted you and asked her about breeding Shady. 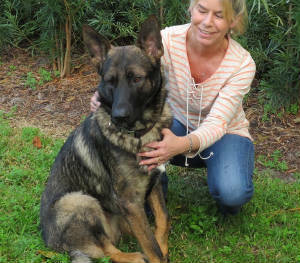 She and I discussed it through email options for each male, she sent me downloads of Caliber and Ganove I decided on Caliber, and after seeing him, I knew that Linda and I had made the correct choice. Shady Lady and Caliber had 7 puppies. 6 females and 1 male, which was fantastic. They are two weeks old now, and just beginning to become adventurous. Yet that's not the whole story. Unlike anyone else that I had ever dealt with, Linda Strand was available to answer questions for me, and provide me with valuable information. I depended on Linda during the whole process. Linda told me when to expect the litter, and how to count the days. She provided me with valuable information concerning diet and care of Shady, not only during the pregenacy, but after the birth of the puppies. Linda continued to stay involved anytime when I asked questions about the puppies, and I am very confident in Linda Strand and her knowledge of breeding. Linda, I thank you for all your wonderful help and for keeping me focused. Without your guidance, this would have been a struggle for me. at 7 mos. old Jack is already 26" tall, and we wonder, how tall is Genove? We're very happy with him! No problems at all. He's so smart. Awesome dog. Jesse was just wondering how tall he'd get, because when we saw Genove, he was big ( of course he was all -filled out ) and jack is big but he's also lean. Hello, Just wanted to let you know how Keria is doing. She is the best dog anyone could ever want. 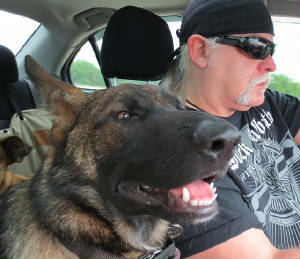 She has adapted very well to Matt and i . Keria loves to ride in the convertible and loves to swim.We Have seen what a great dog she is the perfect dog. She doesn't bark unless she hears noises or feels threatened .We are so happy that we adopted her and we love her so much.Big part of our family now. Yea he's big... 72 lbs at 6 mos 3 weeks old. Training is going good. He is confident and fearless. We're waiting on him to turn 1 before starting protection training. I will continue to send you pictures as he grows. Thanks again. I just wanted to send you an updated picture of Diesel. He is now 1 year old and 100lbs. He is seriously the best dog in the world!! Sorry for the delayed response. Yes, he just graduated obedience school and is doing great. It is great to hear that his father got his OFA certificate. Thanks again for everything, and I will continue sending updated photographs!! Good morning! 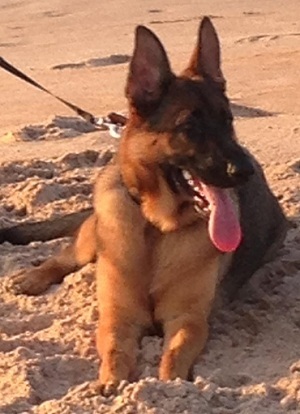 My name is Barbara and my hysband and I are looking to become GSD owners. After spending hours looking for a breeder I came upon your website and immediately knew I wasn't going to have to keep looking!! We looked through all the pictures and information you have on your site. I read through all the testimonials and I gotta say I am impressed!! 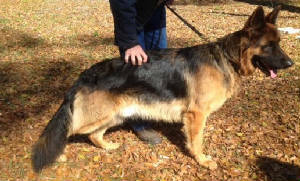 Just looking at the pics my family is in love with girl #2 and would very much love to have her join our family! Barb came with her family from Jax and took their puppy. I wanted to send you a quick note and let you know Sookie is doing great!! She is such a calm and sweet dog! I am so glad that I found you and your wonderful dogs!! Thanks so much!! We will keep in touch!! 6-23 Hey Linda! I wanted to send you an email and let you know how Sookie is doing. I took her to the vet Monday and they were so impressed with her. No one believed that she was born in April!! They all said she is too big to be only 10 weeks! She's 18 pounds 13 oz now. 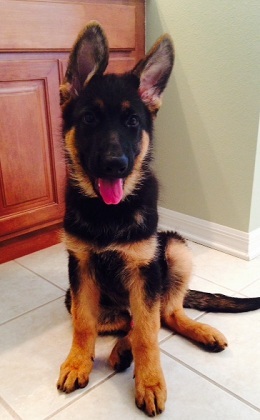 Her ears are standing up!! She is the cutest thing!! As soon as I upload some new pictures of her I will send them to you!! She is such a beautiful dog!! And she has the sweetest personality!! Thank you for your time yesterday. We were thrilled to meet you and are excited beyond belief about our new addition to the family, Lola. 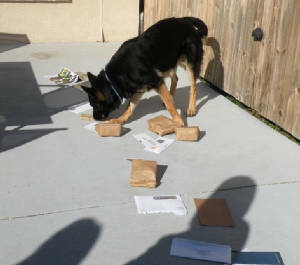 I look forward to receiving any literature that you have regarding what we will need when we bring her home, as well as will look every couple of days on the site to see if you have updated pictures. I hope that she picked a good one-I have little doubt that any of those puppies would have been a bad pick! I am quite impressed. 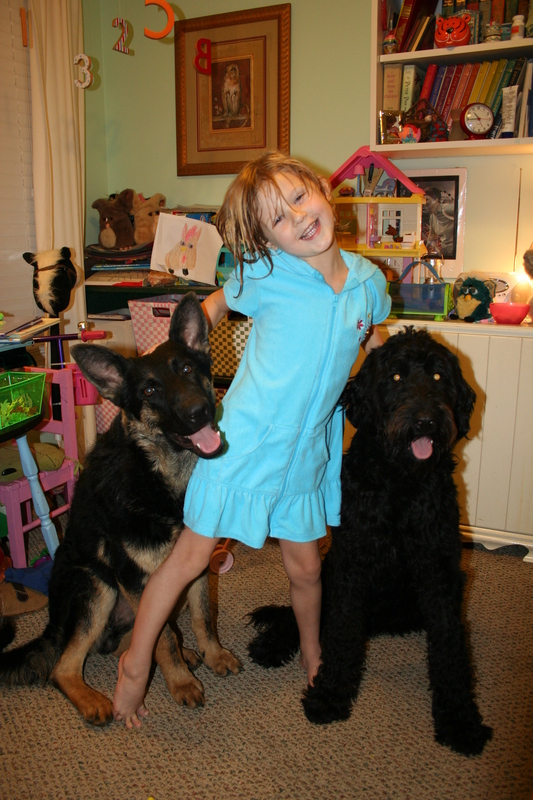 Your daughter is beautiful and so polite (as are the dogs)! Thanks again! I want to thank you for a wonderful addition to our family. 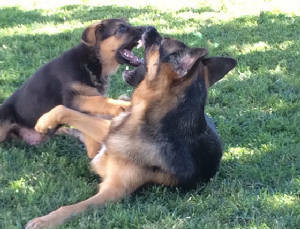 Lola is so well socialized-she fit right in with Max(our 18 mo old GSD)and they are already playing like old friends. Everyone who sees her(the entire island it would seem)stops to say how beautiful she is,. 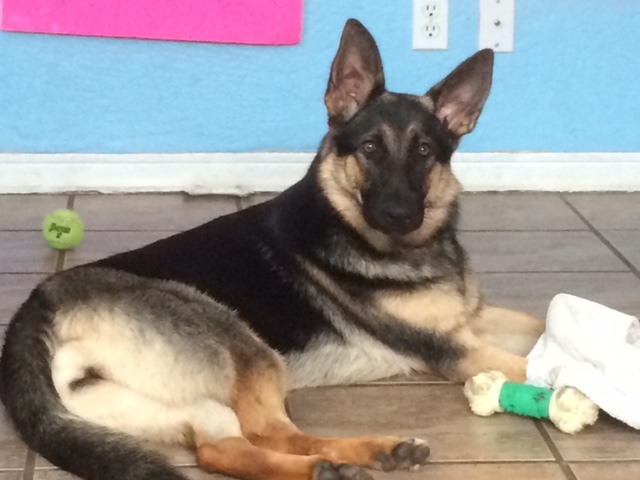 She is coming along well with her training, and only had one accident the first day. She has learned to love her crate-well, at least tolerate it-and is bouncing along, healthy as can be. She has an amazing amount of self confidence, and is totally fearless. I cannot wait to see the adult she becomes. Just wanted to let you know, Lola came back from the Vet-weighing in at an unbelievable 19 pounds at 10 ½ weeks. And she is really really lean-no doubt she is going to be a whopper. I have been walking Sina and Kala up to the store up the street to get the paper on Sunday morn. and Kala is very much at ease. Crossing the railroad track and everything. Today an emergency vehicle went by on St Andrews and it didn't phase her at all. Every time Daly sneezes, Kala runs up to him and puts her paws up on his lap to check him out. He gets a real kick out of it. She only does it when he sneezes. Kala is a real sweety. She is so patient and calm. 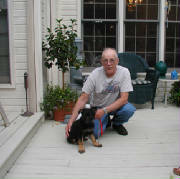 Just wanted to touch base with you about our puppy, Merlin that we purchased from you in April, 2009. He's just over a year old now and is the most amazing dog. He's so intelligent and protective. He weighs in at just over 100 lbs. now. I would like to take the opportunity to thank you for breeding such high quality dogs. Attached are a few photos of Merlin. HI Linda- thanks for photos of his siblings!! Jack is just finishing an 8 week obedience training course. He's a good dog! 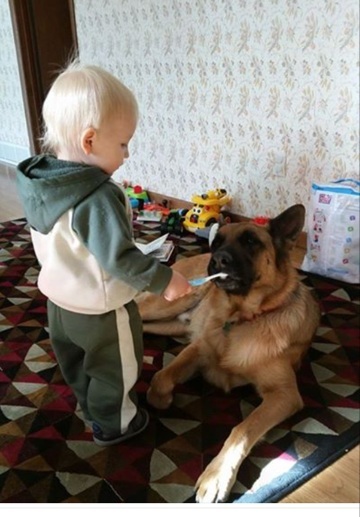 At about a year ( or whenever it's best) we want to put him in training to be a guard dog. Definitely keep in touch. 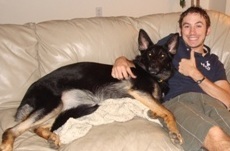 Jesse and I, ( and the whole family) LOVE seeing the pictures! PS: Jack is THE BEST! just a quick update on my wonderful dog Max. She is doing great, she just graduated from advanced obedience yesterday. 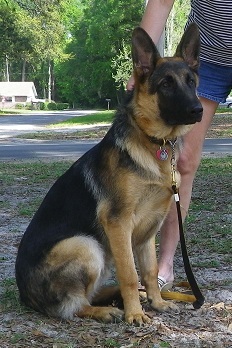 Everybody cannot believe how well behaved and trained she is for only being 7 months old. She is so loving with kids, but then again very protective of her family. We absolutely love her! I attached some pic of her. By the way, she now weighs 66 lbs. Koda is doing great. She is very gentle and the pics show her beauty and how cute she is. Thanks for a wonderful dog. Koda is now 4 months old and weighs 30 pounds. She loves going to the dog park and taking walks. 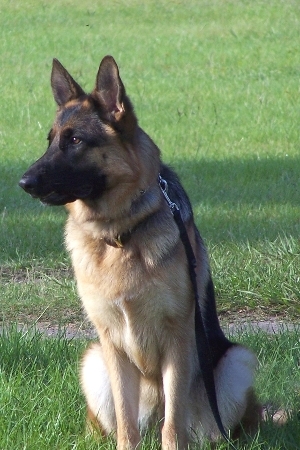 She does very well on some commands such a foos, setz, sook and vly. Still working on getting her to come every time. 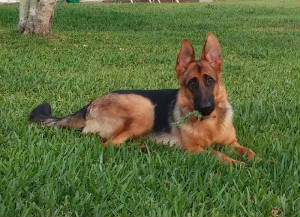 She is an awesome German Shepherd. Evryone comments on how beautiful she is. Here are a few pics. Feel free to share them on you website. Thanks again for a wonderful dog! 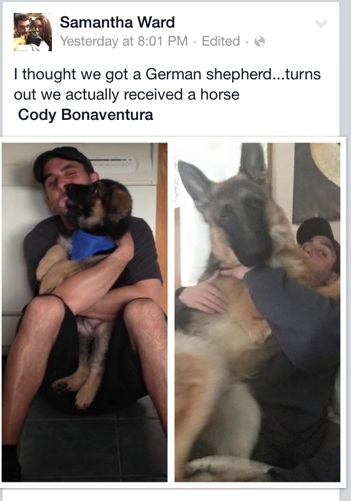 Here are some people who kept in touch about their puppy they purchased from us. Please take the time to read their letters. just wanted to let you know that Max is doing fantastic. She is very well behaved. She knows commands like sit, stay, leave it, watch me, heel, gentle, and come. She is completely housebroken at 11 1/2 wks old! !, sleeps through the night without any whining; she was never really a whiner, just a whimper her and there. She also walks/runs ride by my side and barely tries to walk in front. She also loves the car and running along side my bike (slowly). We take her on a lot of outdoor activities and she is well behaved and has a blast. She is loving and calm and everything I ever wanted in a dog. The nipping has gone down a lot, and we will continue working with that until resolved. She does though act shy around other dog, therefore we take her to doggie day care once a week to let her interact with other dogs while supervised. The vet tech told me she is doing better, it just takes a little while until she comes out of her shell and when she does "here she goes"! Thank you so much for this wonderful dog. You sure are a great breeder and you should be very proud of it. 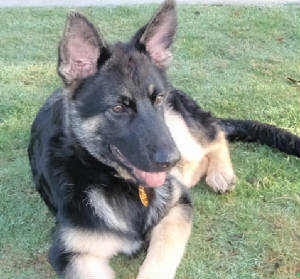 A lot of people compliment me on Max and many of them said they would consider a german shepherd for themselves, so I told them about you, and the service and dogs you provided and they all said they would get with you as soon as they are close to purchasing a dog. Ok, that's it for now. I will send some pics of her soon. 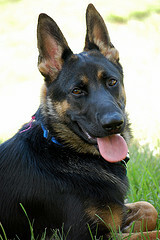 Oh by the way, Max is starting her first obedience class Thursday and I'm sure she will pass with flying colors. I also got Max AKC registration taking care of. Ivonne is from GERMANY, her parents even flew over to help her choose the right breeder & puppy for their family - I am so honored that they chose me! Let your daughter know that we decided to name our puppy Milo J He is so good and so smart. He is almost sleeping all night now but he will only whimper softly to let us know he needs to relieve himself and he is back in his crate bed and asleep again right away. It is like having a baby again!! He has already learned “sit”, “up” (beg position), and “down” using the clicker and small food rewards. My poodle is being a good teacher for him… Milo watches him closely. Anyway, we are just thrilled with him. The photo on the left is my son with him the day after we bought him and the picture on the right was taken today…he is really growing and changing fast! Thanks again and please call me if you have any real estate questions or need a referral for a good realtor in your area. We all love the puppy. She is just what I wanted. Her coloring is beautiful. She is getting to feel more at home so is getting more lively. We took her to the Pizza place in Flagler on our way home. Nadja is still doing great! She goes straight to her crate when she is asked. She sits and waits for her treat. She now loves Yoshi and he puts up with her. She is always wanting to play with him, jumping at his face all the time. Sometimes he runs away from her. She gives him a run for the money! 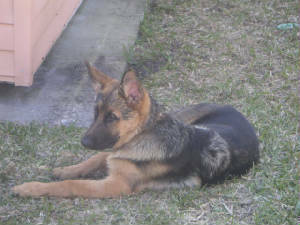 Nadja will be going to puppy classes in about 2 weeks. Martha Hunt has been training her for the upcoming Conformation Show!! I haven't talked to you in quite a while. I just wanted to send you a couple of pictures of Nadja. She is a great dog! You were right ablout her being the better dog for shultzhund. 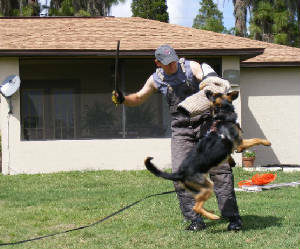 I had purchased several Leerburg training videos, one of them being "How to raise a working puppy", the best thing I ever purchased. The most important thing I did was to not let any one play with her so she would look to me for every command. She just waits for me and wants to work all the time for me. Nadja just turned 1 year on the 22nd of April. Look at her now! Thank you so much for what you do. 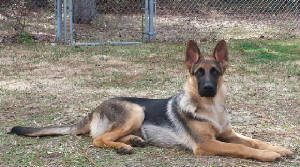 I will be breeding her in next year with a male I purchased from Martha Hunt. I can't wait to see how her puppies will turn out. we now have 3 Imports & co-own a black and Red male with Linda. 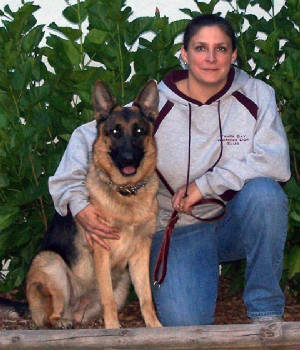 “Linda was thorough, precise and meticulous, she is knowledged of the breed and very caring!" I just want to give you and up date on, Storm. (photo below/ right) He is doing great!! 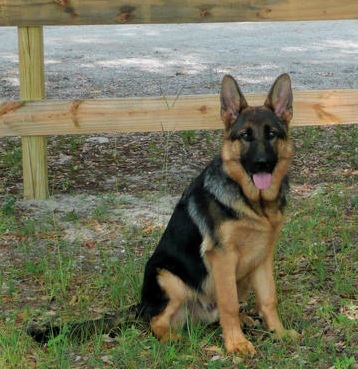 I will be going for his BH in December and hopefully soon after that for his Schutzhund one. Everyone in the Club can't believe how well he is doing. I had a guy offer to buy him. I told him no !. I was also asked if, I wanted to breed him to their female. I told them, I will have to get the okay from the breeder. I am sending you some pic on his bite work. Linda, I just wanted to let you know that Baron has not had one accident yet (And he was in the house all day yesterday!) He went potty every time I took him out. He is so intelligent and of course follows me all over the house and already whines to go outside. He had a clean bill of health at the Vet on Monday and weighed 12.5 lbs. Anyways, I am so grateful for such a wonderful puppy Thank you very much, He is truly amazing!! 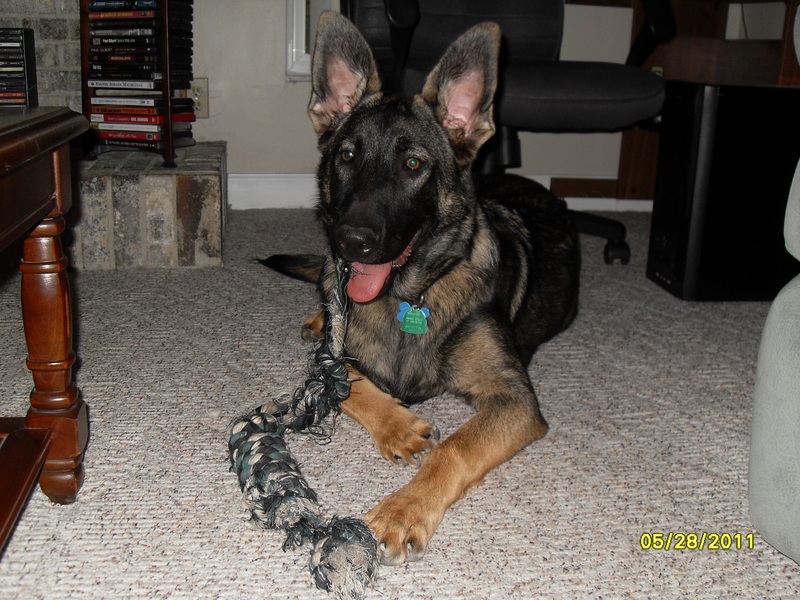 Sincerely, Lori Quast Linda, I just wanted to let you know that Baron is an amazing puppy. 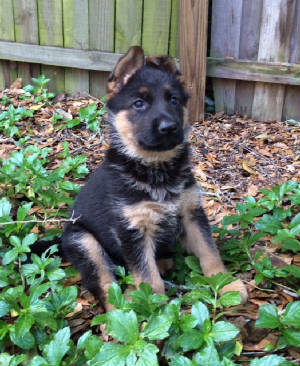 I have had Shepherds all my life but never one that has been so alert & so intelligent at this age. He has already picked up where things are after only one day. I kept his kennel in the laundry room and i put him to bed around 10:00. I got up at 1:30 am 3:30am and again at 5:30am (probably overkill but i know he was so lonely his first night without his family) to let him out. He held it and has not had one accident yet (And he was in the house all day yesterday!) He went potty everytime i took him out. Anyways, I am so grateful for such a wonderful puppy. I will get you some photos in the few days. Thank you very much, He is truly amazing!! 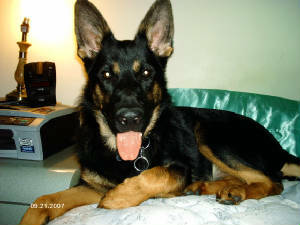 Sincerely, Lori Quast Linda Just wanted to send a couple of pics of Baron to show you how handsome he is. 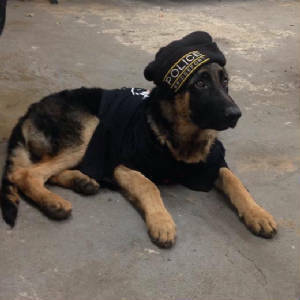 He started his first protection introduction class yesterday. The trainer said in 18 yrs. 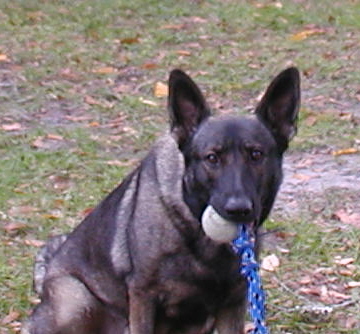 he has only had 2 puppies before Baron go after the whip when they were introduced to it the first time. When he brought that whip out and started using it Baron went crazy!! He was lunging at him snarling and barking trying to get to that whip. Then he would grab the towel and shake it and growl. He has great nerve, nothing rattles him and he is intimidated by nothing. 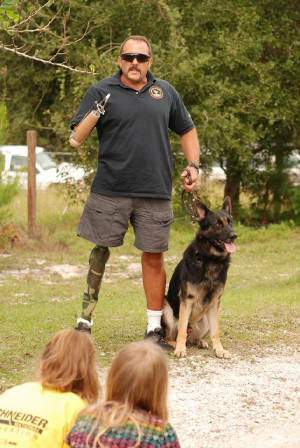 He is doing great at obedience as well. Very good at his sit, down, heel and stays. I take him with me whenever i can. He is such an intelligent and well balanced dog. It's so funny, since the day i got him if he hears children (especially little girls) playing somewhere he goes crazy trying to get to them so he can play. I tell people it's because of Emma, he remembers!! Well, I hope everything is well, Take Care, Lori. P.S. Next time I will try to get some more "action" in his photos instead of him just lounging around! 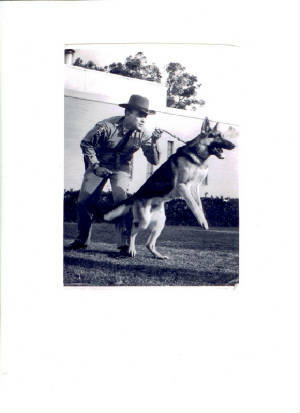 My father when he was with the Marion County Sherriffs Dept. Photo 1970. 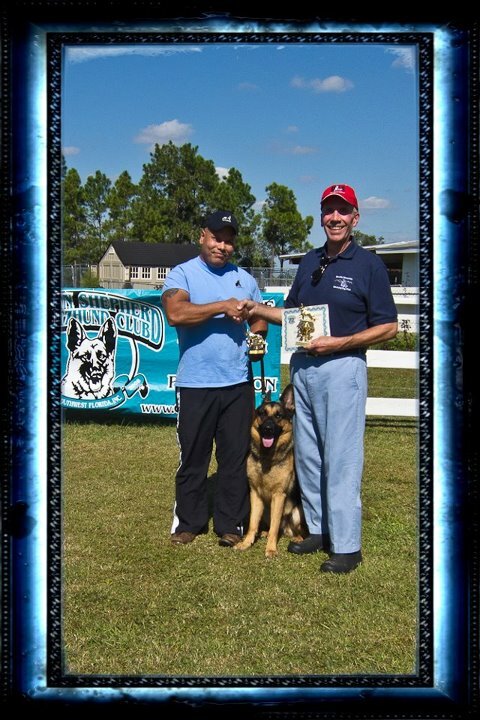 With his K9 "Kirk"
Officer Galan receiving Sch1 with Storm! 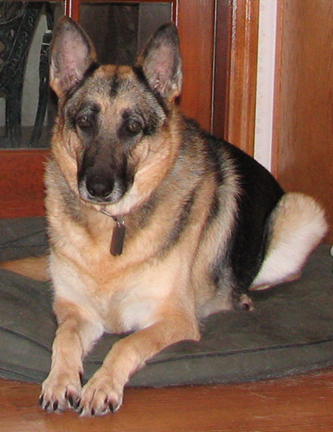 In 1999, I purchased a female GSD puppy ("Radar") from Linda Strand. 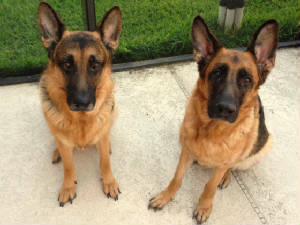 Anyone who has looked around at "All German" dogs will quickly agree that Linda's dogs are top quality at a very reasonable price. 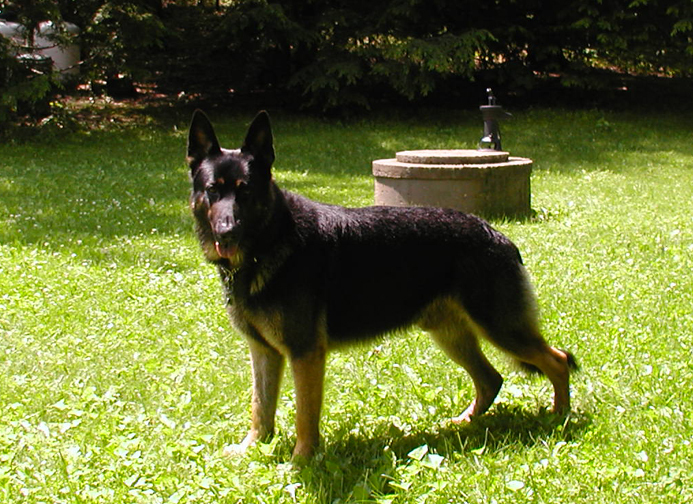 "Radar" has grown up into a mature dog with an excellent disposition that easily transitioned from an outside dog to a well-behaved inside dog. I have never known another dog that could be left alone for long hours inside with no problems at all. I am very happy with the dog I purchased from Linda Strand, and I would highly recommend her to anyone looking for a top quality dog. My next Shepherd will come from Linda. Stephen McGehee Here she is 10 yrs old now! Tasha is from Zilly (sire Sch3/dam Sch1) and Nomar show points/OFA (Ch parents) . Donnie & David have titled these dogs in Rally and Obedience. Tasha is OFA, has all her Rally & CD titles! T-Pol just earned all her Rally titles & now going for CD! 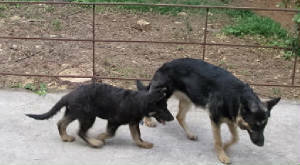 and now has a litter due from Cisco and T-Pol summer of 2012! The trip down from Georgia was well worth it! Our pup is exactly what you said she would be! She is very couragous and smart. 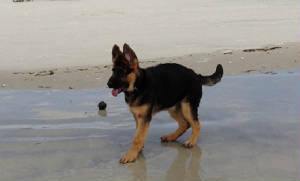 Thank you Linda for the best puppy and mate for our male german shepherd. okay to use your name! Keep in touch! 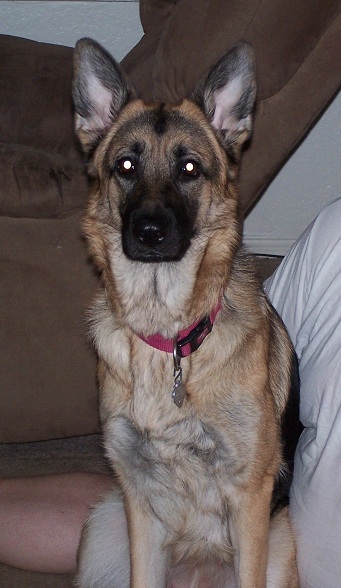 My first dog from my daughter Linda, was Shally, we just put her down at 14 yrs old . My fathers day present was Duke. 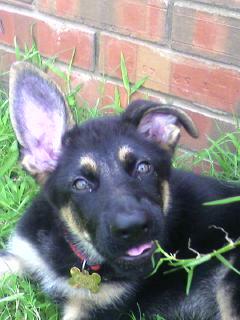 He is the most intelligent Shepherd I have ever owned!! He understands every command I give him! Knows each toy by name & he loves to swim in the Pond and play in the Snow. At 11 months he was 96 lbs, & now he is 28 inches tall and 102 lbs !! The vets love him & his health is excellent. He just sired his first litter -8 pups! A woman from 'Germany' bought 3 of them! My wife and I have spent some time on your website and taken a close look at the pedigrees of your litter's mother and father. We want one of the puppies for sure. We prefer a male. Please tell us how to proceed from here. What convinced us without actually seeing the puppies is the fact that our recently departed Rex von Merlene and your Amina seem to us to be from the same blood lines. Take a peek. We'll bring the papers on our dog just as a matter of interest. We don't want to miss out on this opportunity and would like to send a deposit sight unseen. Please tell us the amount and how to send it. We see Pay Pal on your website but we've never used it and have no idea how so we'll need you to tell us how to do it. And we still want to come see the dogs on Monday at 2 PM, please. Just wanted to let you know that all went very well on the trip home yesterday with Max. He slept in Nancy's arms most of the way. Not bad. He's eating and sleeping and peeing and doing all those puppy things. King, the 8 year old GSD and he are getting along great. Max only woke up and whined twice last night. Other than that he slept. 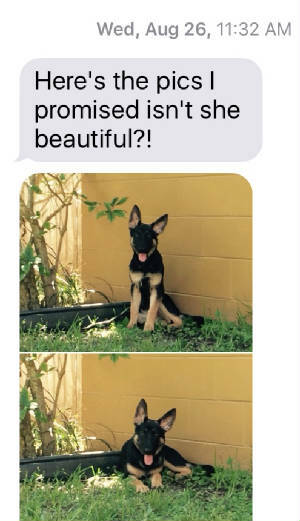 Good boy ! I am amazed that he has taken to walking on a leash already. A little balking at first but then he was fine with it. We put on leash when we take him out the front door. We're going to take him to a puppy kindergarten in a couple of weeks. It's put on my the Brevard Kennel Club so we hope it's good. our new family member, you have brought such Joy to our lives. Thank you for asking about Leika. She is doing just fine weighs about 28 lbs, .she is potty trained to her crate ,but a little problem when she is out .we're having a problem w/her jumping on us .shes only a puppy hope she grows out of it. Linda , I want to thank you again for the opportunity to buy this puppy for my husband. I will gladly be there next Saturday to meet you and the puppy. last weekend Matthias brought me my computer into the rehabilitation clinic and I will try to send some emails with help of my mobile phone. The operation went well, so fare as we can see now. I got a new document for the airport security, because I will now always "piep" when I will go through the airport security. My new hip and I are now trying to adjust to each other and this is not always so easy. It is painful to build new muscles in the operated leg, the operation is just 16 days ago. I am walking with the crutches and also training to go the steps, each day a little more. 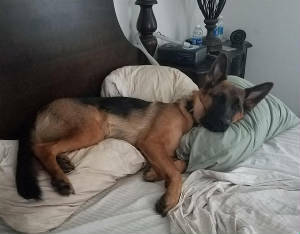 For about 6 month I am not allowed to do any dog sport and have to sleep only on my back, this I hate the most. I don`t know, how long I have to stay here, but I think at least for the next 2 weeks. when you are ready for your new laptop, please contact Matthias, he will help you. Matthias and Mareike enjoyed their holiday in Florida a lot! Thanks for your taking time to be with them. Just a note to let you know Zeus is doing great!! HI, PUPS ARE WELL AND GROWING FAST. MELODY ALVES PORT ORANGE, FL. Thank- you, got the papers today. The puppies are fine. Absolutely beautiful, especially the male. the female is a ball of fire. she must see and inspect everything. if her brother has something, she has to take it. he has become smart though, he takes his things and goes and lays down near reno. she's not quiet so brave as to take his yet. the male pup is Reno’s shadow, its amazing sometimes how you can just read his face as he watches Reno, and then imitates him. he is quite smart. NOW I KNOW MUCH MORE ABOUT MY DOG. I really appreciate your time and YOUR LETTER - it was very helpful. 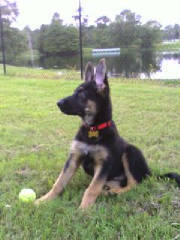 Thought you might like to see a photo of our big guy, Viper, at around 12 -13 weeks old. 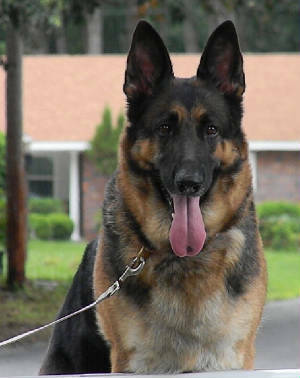 Thanks so much for breeding such wonderful GSDs. Just wanted to let you know that Don referred you to a colleague of his that is in the market for a German Shepherd. So you might be contacted in the next couple days by a guy named Steve Reynolds. Anyway, our Viper is growing by leaps and bounds. 18" at the withers now and 40 lbs (14+ wks old) when I weighed and measured him last week! He is just so beautiful! And so intelligent too! Just wanted to let you know that we took Viper to the vet yesterday for his 16 week checkup. He weighed in at 44 lbs. and he is now standing 20 inches at the withers. The doctor said that Viper is the picture of perfect puppy health! Not only is he growing big and strong, but his fur is so black and shiny that everyone compliments him on how beautiful it is! 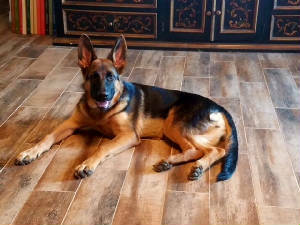 Well ... Viper is officially 6 months old now and I just wanted to give you another update on him. He now measures an outstanding 26 inches at the withers and weighs in around 80 lbs. He is starting to fill out more now and he is turning into such a big, beautiful, strong, healthy dog! So intelligent and eager to please! He is growing up to be EXACTLY what we were hoping for! 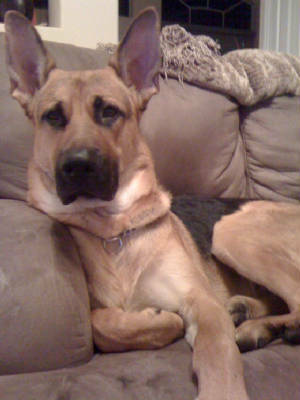 Everyone we come into contact with seems to think he is the perfect example of what a German Shepherd should be! will send you some pictures of her tomorrow. 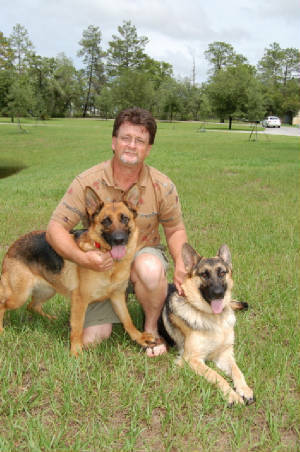 Thanks for the quick responses and help you always have given me, What ever you are doing with these dogs really works! 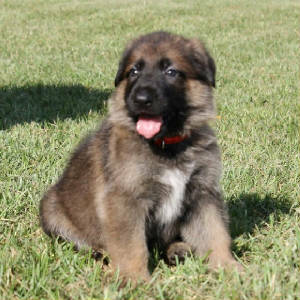 I check your site occasionally to see some of the new litters, and the dogs are absolutely stunning! Not to mention the command presence. Hope all is well. We just had our Christmas cards made and of coarse we included “Bruno”. That’s what we named the pup we purchased from you. 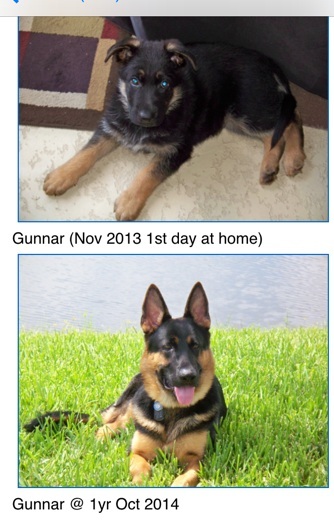 Anyway, I am forwarding you the picture so you can see how he has grown. 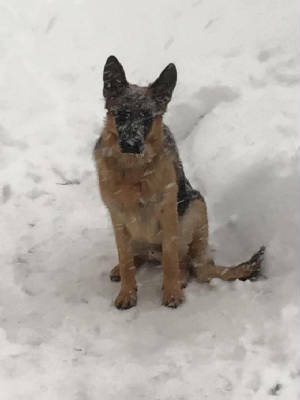 He loves the snow too! Amie just purchased her 2nd dog from ME 2012! 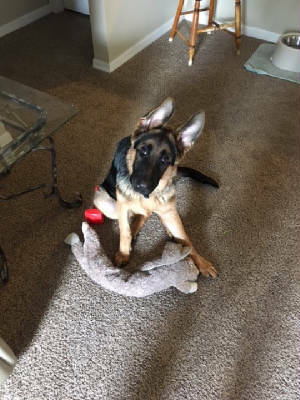 here is the picture of Zeus, its about 2 months old, now he's 76 lbs and the vet said he should be between 90-100 when all filled out. 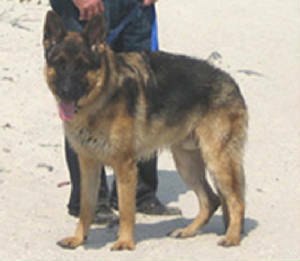 He has an amazing temperament, what a great personality! Thanks again for a wonderful pet. Just wanted to update you on Molly. She is SPOILED ROTTEN! We love her so much already and I don't think anyone could buy her back for any price. I Never saw Virgil so happy he loves her just as much as me if not more. She has many toys and plays with them a lot. We have taken her to Jacksonville and several road trips and she travels great. She is very intelligent and learned how to use the pet door to the back yard in about 1 minute. She will only sleep with my slipper that is so funny. If I can't find one of my shoes I just looked where her beds are and where she is sleeping. She will take it from me and run as fast as she can. She slept in the bed with us the first 3 nights she had a hard time leaving her Mom but after that she settled in just fine. She still does not like the cats too much but they do not pay her much attention. I am very sure she will be well trained at an early age since she listens so well and is so intelligent at such a young age. Like I told you, she could not have a better home.She will love us as much as we love her. Think maybe she already does. She goes back to vet for shots January 10th. She is eating really well and growing like a weed! Schatzi (peanut) is the BEST dog i'v ever seen. She's so smart and sweet, doesnt cry in her crate, when we go for walks she stops when my daughter starts getting to far behind to wait for her, she's starting to get such a personality! Thanks so much! Let me know if these pictures didnt work. It has been a while; Dazzle is now a little over 8 months old. 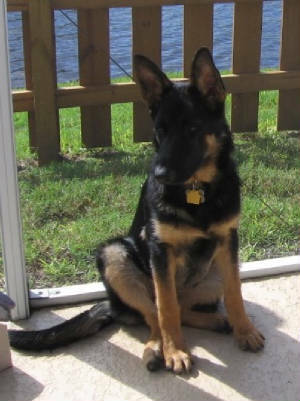 Her ears stood up solidly at about 7 1/2 months. You couldn't get them down if you tried. All that fuss about nothing. I thought you would like to know this because maybe someone else will have concerns in the future. Remember we both read the article on Leerburg that said at 5 months you should start to be concerned. Some dogs just mature later. It could be that because I didn't feed her puppy food that her development was not so rapid, or her teething process was long, who knows. Anyway, Dazzle is absolutely gorgeous. When I walk her people stop and ask where I got her and comment on how beautiful she is. About Leerburg, he insists on a prong collar. How do you feel about this? I have been using one of his prong collars on Dazzle when I go out on the street because at her age she can be unpredictable - cars, bikes, skateboards, etc. Do you walk your dogs? 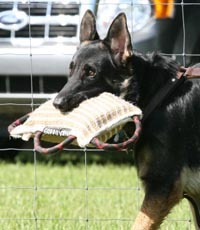 For training, I use the choke collar but Leerburg seems to discourage this. She is truly a wonderful creature and I want to help her to be the best she can be. Any advise you are willing to offer would be appreciated. 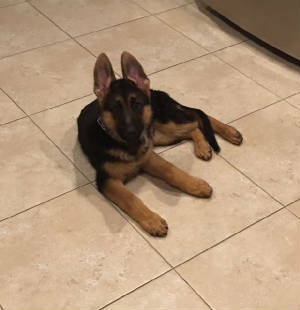 I just wanted to do another follow-up e-mail with you to let you know that Viper went in for his 12 week check-up: not only is he in excellent health but he weighed in at just a tad under 30 lbs! He has grown so much just in the 4 weeks that we've had him. He is going to be so tall! 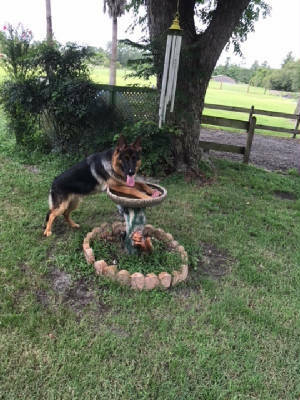 We get comments about him everywhere we go: people think he is just the most beautiful German Shepherd they've ever seen. 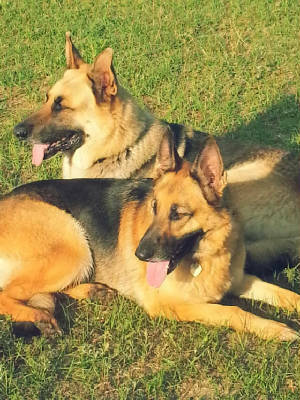 And we've even heard such comments from people who actually own other German Shepherds. We tell everybody "Berg Quella Kennels - look it up on the net!" He has already learned sit, down, stay (even with the door wide open) and he's doing really well learning how to heel also. He loves to go for rides too so we take him with us as often as we can. He is just such a joy! We feel so blessed to have him! Thank you so much for breeding such wonderful puppies! Nadja is doing great! She didn't like me talking to her on the ride home, she would put her head down and look at me sideways. I just let her be and she stayed on the front seat all the way. She didn't even cry. When we got home I let her out in the front yard for about 20 minutes, she seems to love it outside. I had her crate all ready for her so I put her in it and left the door open. She soon came out and wanted to play. I let Yoshi come by and smell her but I didn't let him stay. I don't want her to feel intimidated by him at all. She is starting to learn to sit in front of me instead of jumping on me. She is very courageous, she has no fear at all. 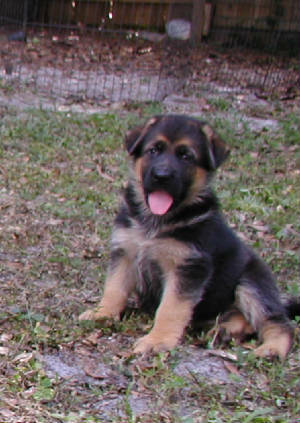 I just sent an email to a schutzhund club near me, to find out times for puppy training. 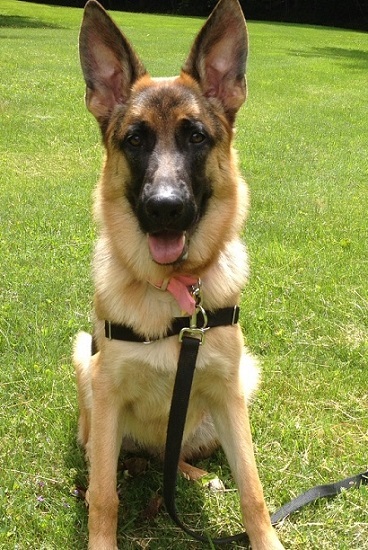 I will keep you posted on how she is doing when she starts training. We also have sold Berg Quella puppies to the Philipines, Honduras & England.